Making faster and better business decisions requires access to vital data in all types of situations. That’s why Proxim’s enterprise solutions provide mobile Internet access for corporate employees as well as corporate visitors. Using Proxim’s ORiNOCO® AP-8100 together with AP-8100 access points, enterprises can now offer Internet access to employees, customers, suppliers and business partners—without sacrificing the integrity of the corporate network. AP-8100 access points create a secure wireless LAN that supports both 802.11a and 802.11b standards, while the AP-8100 provides additional functionality in public areas such as lobbies, cafeterias and conference room. With the AP, corporate visitors don’t have to worry about changing their computer settings to access the Internet. The Dynamic Address Translation feature automatically maps the visitor’s addresses to an appropriate TCP/IP configuration— minimizing the need for IT support. With just one click on their web browsers, visitors can get Internet access or set up a secure VPN connection to their own corporate networks. VLAN functionality ensures your corporate network stays private and secure, by enabling visitors to access the Internet through a separate virtual wireless LAN. Seamless Internet and network access means that visitors can now enhance their presentations with remote live demos, video conferencing or other tools that can make meetings more productive. Integrating the AP into an enterprise network of access points provides all business partners with access to the information they need to make more effective decisions. The AP specifically addresses the needs of small and medium size venues, such as regional airports, hotels and coffee shops. With typically less than 100 concurrent users and limited coverage areas, small and medium venues can greatly benefit from this all-in-one access point and gateway. The AP eliminates the need for expensive back-end gateways while offering advanced gateway features that simplify the user experience, enable instant customer acquisition and reduce operational costs. Home page redirection and Dynamic Address Translation, for instance, provide seamless Internet access regardless of the user’s network settings. Features such as this ensure ease-of-use for the customer, minimizing customer support calls and hot spot IT costs. Support for industry-standard billing and authentication not only ensures smooth integration with most hot spot providers’ existing billing processes, but also enables service differentiation. Hot spot operators can use billing methods, like pay-peruse and prepaid, for on the - spot customer acquisition. Various authentication methods allow customers to seamlessly roam between their corporate enterprise and multiple hot spots, while advanced security ensures the customer’s privacy. Supporting both Wi-Fi 802.11b and IEEE 802.11a standards and up to 500 concurrent users, the AP-8100 provides an ideal hot-spot-in-a-box solution for small and medium size venues. For large venues, such as large international airports and convention centers. These enterprise-class access points work in conjunction with a standalone access gateway to support hundreds of concurrent users and sizeable coverage areas, typical of large venues. With the AP, venue owners and service providers can roll out a complete wireless LAN infrastructure that can be easily managed from a central location. 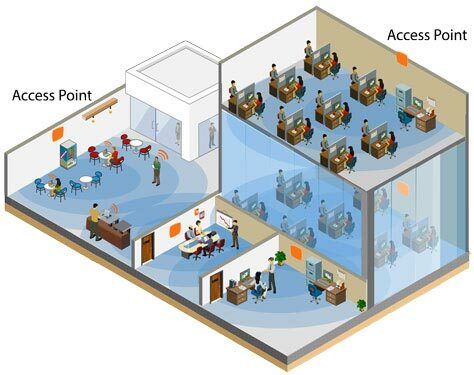 And the cost of the back-end gateway can be amortized over multiple access points, usually required by a large venue. These attributes make the AP wireless LAN an easy - to deploy, costeffective hot spot solution.